Explorez deux trésors culturels de Campanie lors d'une visite d'une journée complète au départ de Sorrente. Découvrez les ruines d'une ancienne ville grecque à Paestum, qui présente certains des temples grecs les mieux préservés du monde, ainsi qu'une collection d'art ancien d'un musée. Ensuite, parcourez la superbe ville côtière de Salerne qui surplombe la mer Tyrrhénienne et profitez d'une visite guidée à pied de la vieille ville historique et de la cathédrale. Roberta and Ferdinando made the tour spectacular with their great sense of humor, deeo knowledge and love for the region and warm hearted dealings with their clients. 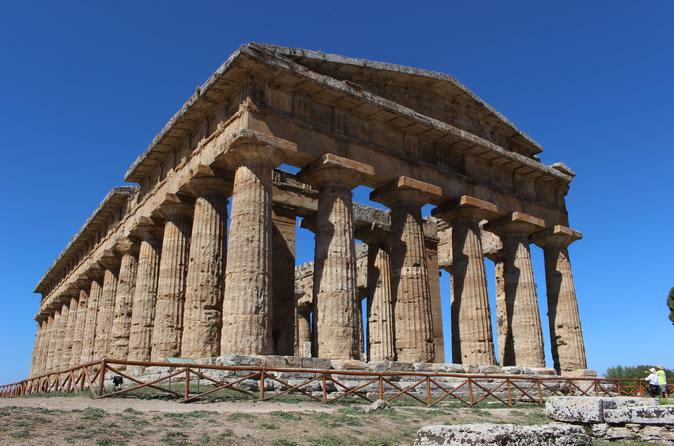 Salerno and Paestum are worth seeing. Truly. Try to go to Salerno on the 21st of the month so that the Treasury is open to the public. As for Paestum, seeing the oldest original best preserved Greek temples and being able to step inside one of them...need I say more? Good tour. Not too much activity on a hot day. The stop in Salerno is quick, just enough time to see the cathedral. The crypt is beautiful. The ruins are just amazing. Our guide was very good. This was an unexpectedly fantastic site to visit . The tour guide was informative and hospitable. Highly recommend it. This was actually our favorite day trip while we were in Italy. Salerno was a nice stop off, and Paestum was very interesting we had the right amount of time in the ruins and the museum. I would highly recommend this to anyone using Sorrento or Naples as a base for exploring the area. Although Paestum is quite a bit further South than either of these locations, the ride was scenic and relaxing. The tour provided a little taste of Greek history, and the guide was very good. Be sure to read up on the history of the area and its multi-cultural influences before the trip. Left Salerno too quickly. Should have divided the time equally between the two places. 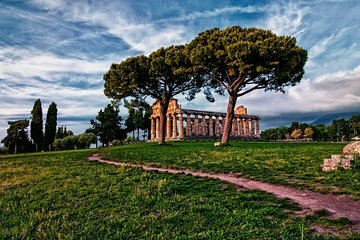 Paestum is really off the beaten path when it comes to historic sites in Italy. That may be starting to change as the area around the historic site is becoming more built up. Christine, the tour guide, is immensely knowledgeable and has so many fascinating things to share along the drive and at the sites in both Salerno and Paestum. In Salerno you have the option of continuing the tour into the cathedral of simply spending the time on your own in the city. Getting to Salerno and Paestum from Sorrento takes a fair amount of time. There is a lunch break and the food was very good. If you're a history buff then you'll really like this, if not then you'll probably be bored. If you're somewhere in between then I'd say give it a shot. If nothing else, it is unique and not a place that many tourists visit.